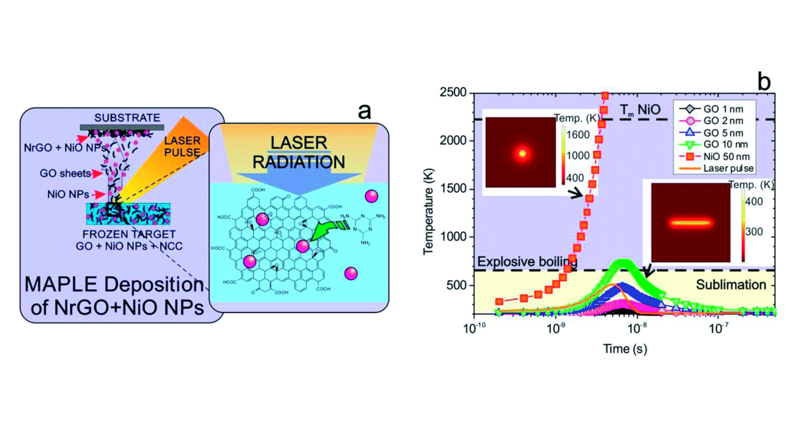 A versatile method based on the matrix assisted pulsed laser evaporation (MAPLE) technique was used for the fabrication of graphene-based electrodes for application in supercapacitors. The simultaneous deposition and chemical transformation of graphene oxide (GO) and GO–NiO nanoparticles was attained by including nitrogen-containing chemically reactive compounds (ammonia, urea and melamine) in aqueous MAPLE targets. Morphological analyses reveal the formation of hundreds of nanometres to tens of micrometres thick porous films on both plastic and metallic flexible substrates. Structural and compositional studies, carried out by transmission electron microscopy, and Raman and X-ray photoelectron spectroscopies, disclose significant deoxidation and nitrogen doping of the GO material. The electrodes reveal remarkable electrochemical performance, showing a maximum volumetric capacitance of 350 F cm−3 (9 mF cm−2 areal capacitance) in aqueous electrolyte. Symmetric supercapacitors fabricated with these electrodes reveal excellent long-term stability at high specific intensities. From the obtained results, it can be asserted that the reactive inverse MAPLE method stands out as a promising technology not only for the adaptable fabrication of flexible graphene-based composite electrodes but also for a wide variety of advanced functional materials for diverse applications. The Institut Joaquima Pla i Farreras from Sant Cugat visits ICMAB and learns the secret of batteries!